Sac and Fox Nation of Oklahoma is a federally recognized known as the “Sac and Fox Tribe of Indians of the Mississippi River in Oklahoma,” and commonly known as the Sac and Fox Nation. By the 1870s, through a series of dislocations they found themselves in Indian Territory. The misnomer “Sac and Fox” is a historical accident, a conflation of “Sac” (Sauk), or Thâkîwaki (“people coming forth [from the outlet],” i.e., “from the water”), and “Fox,” or Meskwâki (“people of the red earth”) misapplied by the U.S. government during treaty negotiations in 1804. Although they were historically associated and closely related by language and culture, the two peoples have always remained geographically and politically distinct. The Meskwaki have resided on the Meskwaki Settlement in central Iowa since 1856, and the Thakiwaki have been in central Oklahoma since the 1870s. The contemporary Sac and Fox population in Oklahoma claim to be predominantly of Thakiwaki decent and typically refer to themselves as both “Sac and Fox” and Sauk. The most notable armed conflict involving the Thakiwaki is perhaps the three-month long Black Hawk War of 1832. That conflict occurred shortly after their removal. It entailed an extended series of skirmishes between the United States and a dissident band of one thousand that included five hundred warriors led by Black Hawk. Although Black Hawk survived, the event itself ended tragically with the slaughter of unarmed Thakiwaki crossing the Mississippi River. Afterward, only 150 to 200 of the original thousand dissidents rejoined their compliant counterparts on the Iowa side of the river. Some Thakiwaki call the Black Hawk War a historical example of an enduring spirit of resistance. Indeed, Black Hawk’s name and a symbolic representation occupy the center of the contemporary Sac & Fox Nation seal and flag. Some, however, viewed the war as a watershed, signifying the last armed resistance to the white encroachment and resettlement east of the Mississippi River. A contemporary of Black Hawk, Keokuk provided an important contrast. Keokuk desired to negotiate and maintain peaceful relations with what he perceived to be an ever growing and expanding white population. These historical embodiments, one of resistance and autonomy and another of peace and diplomacy, represent a continuing dynamic in Thakiwaki political life. Members of Thakiwaki society have historically belonged to one of two groups–shkasha or kîshkôha–as well as to a clan that has harbored both familial importance as a name group and ceremonial significance as a ritual unit. These memberships have served significant functions in the continued practice of cultural observances, including adoption, naming, and burial ceremonies, a seasonal cycle of clan feasts, and various dances. Members have also been involved in the religious practices of the Drum Society, the Native American Church, and Christianity. The best known Sac and Fox individual may be Olympian Jim Thorpe (1888–1953), symbolically represented on the Sac & Fox Nation seal and flag by five Olympic rings. They have their own system for vehicle registration and issuance of license plates for Sac & Fox Nation members. Although the state of Oklahoma fought the practice, on May 17, 1993, the U.S. Supreme Court ruled in favor of the Sac & Fox Nation. The Thakiwaki now call May 17 “Victory Day.” Other American Indian nations have since followed their lead. 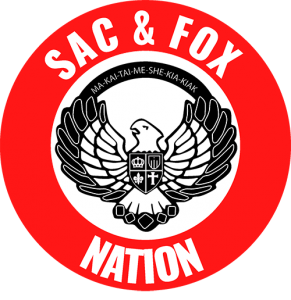 Originally governed by a hereditary clan system, the Sac & Fox Nation have a constitutional government and business committee. Leadership lies with an elected body of five officials. Elections are held on odd-numbered years, and each official serves a four-year term. The national headquarters is located five miles south of Stroud and is situated on approximately 1,032 acres of the original Sac and Fox Reservation. Often called Thâkînâwe, “Sauk country,” the former reservation area is the center of contemporary community life. Most of the approximately 3,000 Sac & Fox Nation members live within or near the area, concentrated around the towns of Cushing to the north, Shawnee to the south, and Stroud in between. The Sac and Fox Nation is headquartered in Stroud, Oklahoma with tribal jurisdiction that cover Lincoln, Payne, and Pottawatomie Counties of Oklahoma. Sauk is the language of the Sac and Fox people. Language is the Sac and Fox expression of how they see the world. The languages of the Sac and Fox contain the accumulated knowledge of all their ancestors. Although the punishment for speaking their native language at the Sac and Fox Agency School meant a loss of identity for several generations of the tribe, the language and culture continues. Several efforts are currently underway to enliven the identity of the Sac and Fox as peoples. Originally governed by a hereditary clan system, the Sac & Fox Nation now have a constitutional government and business committee. Leadership lies with an elected body of five officials. Elections are held on odd-numbered years, and each official serves a four-year term. The national headquarters is located five miles south of Stroud and is situated on approximately 1,032 acres of the original Sac and Fox Reservation. Often called Thâkînâwe, “Sauk country,” the former reservation area is the center of contemporary community life. Most of the approximately 3,000 Sac & Fox Nation members live within or near the area, concentrated around the towns of Cushing to the north, Shawnee to the south, and Stroud in between. They have their own system for vehicle registration and issuance of license plates for Sac & Fox Nation members. Although the state of Oklahoma fought the practice, on May 17, 1993, the U.S. Supreme Court ruled in favor of the Sac & Fox Nation. The Thakiwaki now call May 17 “Victory Day.” Other American Indian nations have since followed their lead.